As a young boy, Dr. Reggie Edgerton was touched by disability. He himself had polio when he was a child, and till this day his left hand is slightly smaller. Going through this experience had a profound effect on Dr. Edgerton, and no doubt is one of the reasons he’s been obsessed with understanding how neural networks work in the spinal cord control movement for nearly 40 years. And the best part, he has more hope for SCI research than ever before. With his research program funded by both the Christopher and Dana Reeve foundation and the NIH (the National Institutes of Health) his research team has made groundbreaking discoveries in the realm of electrical stimulation of the spinal cord. To learn how this North Carolina boy ended up making miracles come true in a research facility in California, read on for the passionate story of this talented spinal cord injury researcher. At almost 75 years old, Dr. Edgerton has been in the game for a long time. He first got his BS degree from East Carolina University, and next headed to Michigan State University to receive his PhD in Exercise Physiology. A former swim coach, researching how the spinal cord works and getting muscles to move again was never his original goal. After graduation he became a professor of kinesiology at UCLA, a job he thoroughly enjoyed but while on sabbatical one summer in Sweden, where he met famed neurophysicist Sten Grillner (who was studying the locomotion of cats who had their spinal cord severed at birth) he was enthralled. Meeting Grillner had a profound effect on Edgerton. He saw that the cats, when placed on a moving treadmill and given a dose of medicine called L-Dopa, could walk. Even though Grillner was never able to replicate these results in humans, Edgerton was so inspired that he went back to UCLA to study the very same thing. It may have taken decades, but Dr. Edgerton is finally seeing results in humans from his many years of dedication. Amassing research money has not been easy over the years for Edgerton since many believed his theory of retraining the spinal cord was hogwash, but he never let that stop him. In 2011, along with other noted SCI researcher (and one of our previous SCI Superstars) Dr. Susan Harkema, he finally saw some of the first a real evidence that they were on the right track – they were able to get Rob Summers, a man who had been paralyzed for six years prior, to stand on his own again. He and his team implanted a device inside of Summers that reads his brain signals, and then send them to his muscles using simulators. For anyone who’s been paralyzed from several years, just the possibility of being able to do this again is huge, and they are helping several young men with paraplegia stand, and feel more all over the bodies, including getting some sexual function back as well. Dr. Edgerton’s research is more active than ever before. 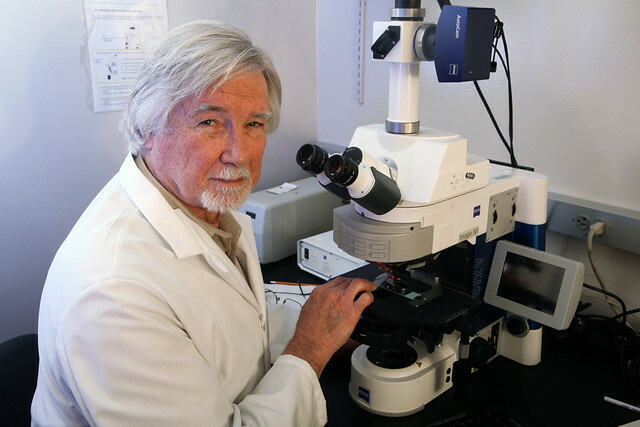 He now has his own research facility at UCLA called the Edgerton Neuromuscular Research Laboratory where he has nine other researchers working alongside him, and he is on the official board for the Christopher and Dana Reeve Foundation. 34 more people are slated to undergo the same procedure as Summers in the next 2 years. Edgerton also hopes to add their first female patient to the study, which many have been wanting to see. One of the biggest breakthroughs in SCI research yet, this “Big Idea” as dubbed by the Reeve Foundation certainly is that, and we can thank Reggie Edgerton for bringing it to the States. Do you think Edgerton’s SCI treatment will prove the best one yet? – V. Reggie Edgerton, Ph.D. This entry was posted in News & Updates, SCI Superstars and tagged Reggie Edgerton, spinal cord research, spinal cord stimulation, stan grillner, UCLA on April 14, 2016 by Tiffiny. Every year we like to help our readers with their taxes and hopefully save them a few bucks by sharing the latest disability tax deduction information for those living in the United States. Since we’re getting close to the due date for your 2016 taxes (due April 18, 2016 — we have 4 more days than usual thanks to an overlap of Federal holidays), we wanted to share the latest disability tax deduction information before you file your taxes. If you haven’t filed yet, please check out the disability tax credits below for 2016. And remember, if you have a spinal cord injury you’re approved for most of the disability tax deductions you’ll see below. – Earned Income Tax Credit (EITC): If you made less than $14,880 in 2015, you’re eligible for this tax credit. Many people with SCI use this credit if they’re only working part-time. If you are single with no kids, this credit is $507 for 2016. Even if you didn’t make enough money last year to file, you should still file since you could still be eligible for this tax credit. And if you have kids, this credit increases up to $6269. – Child or Dependent Care Credit: And lastly, if your spouse helped pay for your care last year, they are eligible for this tax credit. The maximum credit you can claim for this expense for 2015 is $3,000. – Medical Costs Deduction: If your medical costs exceeded 7.5% of your adjusted gross income in 2015, you can deduct medical costs if they’re itemized. Deductible expenses include everything from medical and dental costs to travel expenses for treatments and medical insurance premiums. Even the gas it takes to drive to the pharmacy can be included. Home modifications can also be included in this deduction category if they were done to make your home more accessible. This can include a wheelchair ramp, chair lift or grab bars, modifying hardware, electrical fixtures or railings or the widening of doorways or aisles. Personal Use Items. You can’t include in medical expenses the cost of an item ordinarily used for personal, living, or family purposes unless it is used primarily to prevent or alleviate a physical or mental disability or illness. For example, the cost of a toothbrush and toothpaste is a nondeductible personal expense. In order to accommodate an individual with a physical disability, you may have to purchase an item ordinarily used as a personal, living, or family item in a special form. You can include the excess of the cost of the item in a special form over the cost of the item in normal form as a medical expense. – Lawyer Expenses Deduction: If you hired a legal professional last year to fight on your behalf to help you get the SSDI benefits, you can deduct the finder’s fee from your tax return. – Impairment-Related Work Expenses Deduction: If you are a person with a disability, you can take a business deduction for expenses that are necessary for you to be able to work. If you take a business deduction for these impairment-related work expenses, they aren’t subject to the 10% limit that applies to medical expenses. – Not specifically covered under other income tax laws. Whatever you do – don’t let the fear of filing overwhelm you. With helpful online sites like Turbotax, H&R Block and free filing locations all around the country (go here to find a location near you), you should be able to file seamlessly and ensure you get every single disability tax-related deduction you can. This entry was posted in Feature stories and tagged disability tax credit, disability tax deductions 2015, spinal cord injury tax deduction on April 12, 2016 by Tiffiny.